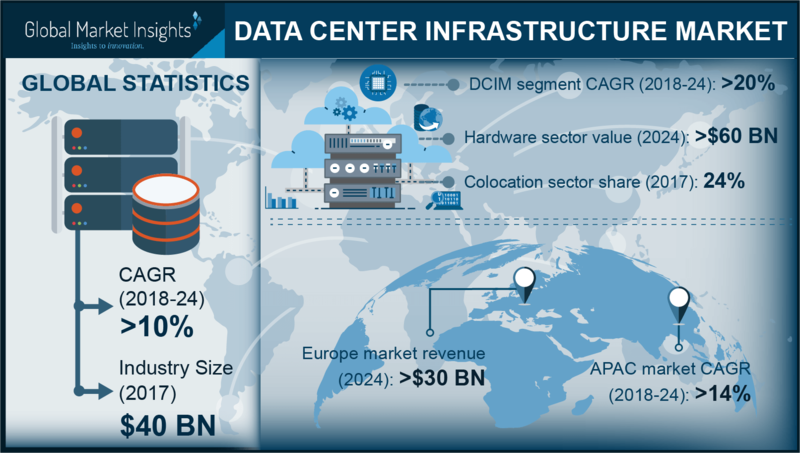 A highly compelling vertical of the data center business space, DCI Market (data center infrastructure) has lately been characterized by the ever-growing digitalization and technology advancement trends. Pertaining to the basal requirement of enhanced operational efficiency, numerous IT organizations have been installing data centers on a considerably humongous scale, in a bid to deliver an innovative experience to customers. As myriad geographies strive to increase their GDP with the increased adoption of digitization, a highly organized framework of data centers becomes all the more pivotal. This has in turn, emerged as a crucial driving factor for data center infrastructure market. Modern technological developments such as AI, cloud computing, and DCIM have indeed had a remunerative impact on DCI Market. Of late, companies struggling with a not-so-impressive organizational performance due to increase in workload have shifted their focus on outsourcing, leading to an escalated growth in organizational data traffic. In a bid to handle this tremendous data inflow, companies have been expending funds on the construction of new data center facilities, gradually providing an impetus to data center infrastructure market. Enumerated below is a detailed overview of how the emergence of numerous technologies have impacted the commercialization landscape of DCI Market. In the last few years, the emergence of artificial intelligence accompanied by machine learning has led to a massive transformation in the IT scenario by bridging data center platforms through analytics technologies. This change of dynamics has turned out to be rather beneficial for the enterprises to improve network infrastructure efficiency. The Internet giant, Google has also acknowledged that the deployment of AI-assisted data centers is certain to transform the future technology needs. The growing acceptance of Internet-enabled devices and shifting trends toward usage of cloud computing facilities has thus been augmenting the demand for data centers on large scale. This requirement, in addition to the exponential rise in big data applications has led to data center infrastructure market establishing itself as one of the leading electronic verticals there is. Citing an example validating the benefits of AI assisted data centers, internet behemoth Google, in 2017, worked to minimize the overall data center power consumption by 15% with the help of artificial intelligence, which is ultimately expected to save millions of dollars for the company. With Google laying down a strong benchmark, numerous other players are anticipated to follow suit, which would significantly impel data center infrastructure market share. The promising increase in productivity after the incorporation of AI is thus getting inherently popular, paving the way for data center infrastructure m to generate sufficient revenue. A pivotal end-use domain that has been majorly impacted by the rapid penetration digital technologies is the banking sector, that has brought about an enormous change in its existing operational models. In order to carry out several routine tasks including new checkbook generation, account balance viewing, and money transfer, customers have been using numerous banking tools dependent on machine learning aids. Recently, the Indian government has launched the Digital India initiative, in which the Indian Banking, Finance Services and Insurance (BFSI) sector is supposed to play a critical role. The government has also introduced numerous other initiatives including Jan Dhan Yojana under the Digital India policy, for financial inclusion and unique identification with biometrics which requires an excellent security system to prevent data breaches. Quite overtly, because of security concerns, data centers have been touted to become a vital aspect of Digital India, which in turn would majorly impact the revenue graph of data center infrastructure market from the BFSI industry. In addition to BFSI, other trending sectors such as telecom, social media, and IT have also been contributing to the Digital India initiative at a fast pace. Driven by the rising demand for advanced technology and a favorable government framework, India DCI Market share is likely to escalate over the years ahead. Taking into account the operational benefits of data centers, most of the IT companies have long since been focused on inking long-term deals with service providers. Recently, the Indian IT giant, Tech Mahindra signed a multi-year deal with IBM to strengthen its high-performance computing and enable data center transformation. Through this agreement, IBM will deploy its modern IO subsystem technology at Tech Mahindra’s next-gen power systems servers to speed up data-intensive workloads. In totality, the agreement primarily aims to help Tech Mahindra’s clients transfer demanding workloads to IBM POWER9. Tech Mahindra incidentally, already occupies a coveted position in DCI Market. Recently, an Australian retailer successfully transformed its business application comprising databases and SAP applications to Tech Mahindra’s data centers. Endowed with in-depth expertise in power innovations, data center design, and migration, Tech Mahindra is looking forward to generating automated data solutions which could help customers transfer critical workloads effectively. This approach of IT giants in transforming existing technology infrastructure is likely to fuel data center infrastructure market size in the ensuing years. Merely a week before, the San Francisco-based digital transaction management service provider, DocuSign declared that it is going to launch three new data centers in Australia. With this new establishment, the American company plans on providing the highest degree of digital convenience to customers. Reportedly, as of now, nearly 61% of Australians still use a manual mode of transaction with the government. The glitch would be eliminated with the deployment of new data centers, as DocuSign plans on offering data privacy, data residency, and online & mobile-optimized transaction services which will bring about a massive digital transformation across Australia. The incidence highlights the fact that the commitment of tech giants toward investing digitized infrastructure development is poised to expedite DCI Market trends. Speaking more about data center infrastructure development, it is prudent to mention that companies have been working to expand their product portfolio across several geographies. Say for instance, the U.S. data center provider, CyrusOne has acquired more than 68 acres of land to build a data center facility in Arizona. Prior to this data center facility development, CyrusOne had been already operating 45 data center facilities located across Europe, U.S., and Asia. With the heavy demand for cloud services from existing as well as new customers, this data center service provider is likely to further expand its business gateway across the globe. As the complexity of organizational operations is becoming more and more convoluted, the risk of data loss is also increasing simultaneously. In order to hold themselves in good stead, companies have been enhancing their infrastructure with help of numerous modern technologies. The use of artificial intelligence and IT automation software has the ability to quickly recognize and eliminate performance bottlenecks which will ultimately reduce administrative time as well as costs. The deployment of technologically driven data centers for monitoring servers, storages, networks, and virtual machines is thus slated to propel DCI Market share over the years ahead. The prevalence and implementation of various automation technologies, cloud computing, and cyber security across the IT sector is projected to continue influencing DCI Market outlook. As the IT domain stands to progress extensively in the decades to come, the future of data center infrastructure industry looks anything but obscure. With the robust technological advancements that have been making their presence increasingly felt by the day, data center services market contenders are looking forward to extending their regional reach by building new advanced data centers. Powered by the much-expected transformation of most of the businesses from traditional models to digitization to ensure operational as well as energy efficiency, DCI Market size is expected to surpass USD 90 billion by 2024.